Start with a full set! 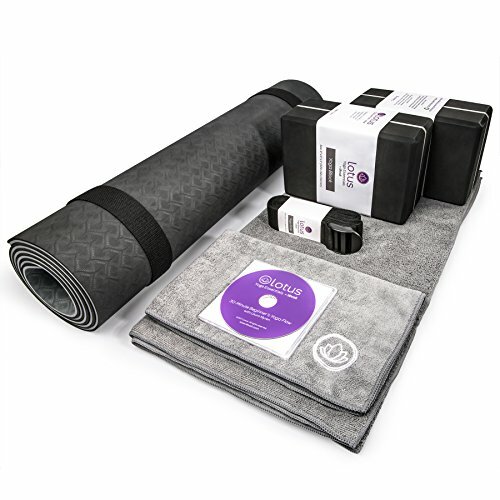 Premium 8-piece set includes: 1 yoga mat, 2 yoga blocks, 1 yoga mat towel, 1 yoga hand towel, 1 stretch strap, 1 carry strap, 1 thoughtfully designed carrying case. BONUS: 1 free professional DVD teaching video included! The ultra-thick yoga mat is made with high-density, non-toxic, anti-tearing TPE material. Non-slip surface enhances traction and allows you to maintain balance as you exercise. Enjoy extra safeguard from injury. Includes an integrated carry strap. Provide support and balance with our durable foam yoga blocks. Deepen your stretches and poses with our 8-ft yoga strap that improves overall flexibility & balance at any practice level. Enjoy immediate video instruction! We consulted a local yoga expert to show you the ropes! Beginners and well-seasoned yogis alike can enjoy a 30-minute yoga flow, totally complimentary of Levoit Yoga Essentials. Designed to be beautiful and functional for yogis, yet adaptable enough for multi-use (e.g., daily exercise and workout routines, resting, protective floor covering for children, outdoor activities).